The following article was from PoliceOne.com and the intended audience was law enforcement officers. However - much of the information could apply to ARES volunteers responding to assist served agencies during an emergency. As reports of the crisis in Japan continue to dominate the news, we're reminded that mass disasters of various types can happen anywhere, anytime. Obviously, it's critical that you and your agency candidly evaluate your level of preparedness for such an event from a professional perspective, but perhaps just as important is evaluating your family's level of preparedness. If a mass disaster hits, you'll be called away for who knows how long and you'll need to stay focused in order to perform safely and effectively. Your attention will need to be on your job, not on concerns about your family and whether they know what to do. In the event of a crisis, do you and they feel confident that they're ready to self sufficiently function without your direction and involvement? Have you discussed things like evacuation plans and routes, emergency survival tactics, things to expect and avoid in a mass emergency involving public panic, things to do and not do in the event of water, power and/or communications loss, who best to call for help when you can't be there, discussion of the roles each family member would play in the event of an emergency (for example, that the older kids will take responsibility for the younger kids while mom or dad does whatever needs to be done). I live in earthquake country and need to be prepared for the unexpected natural disaster at any moment in time. It just so happens that twice a year when we change the clocks for daylight savings not only do I change the batteries in my smoke alarms, but I also tear apart and put back together again my family's earthquake kit. I make sure the clothes set aside for my son will still fit him six months from now, and the cans of food have expiration dates more than six months out. I also review with my wife our out-of-state emergency phone numbers, our primary rally points and action plans, as well as contingencies for the safety and welfare of our son at his school. You may live in Tornado Alley, or along the coastal areas of the Atlantic Ocean or Gulf of Mexico (where hurricane season runs from June through November). Or you may live near the many thousands of miles of underground natural gas pipelines that, when they go they really go. Wherever you are, let the disaster in Japan serve as an impetus to speak with your family about this stuff, because when a mass disaster event happens in your area, you're almost certainly going to be serving in your role as a public safety officer, not a dad, a mom, a son, or a daughter. You'll rest much easier knowing that they'll know what to do. West Gulf Division Director Dr. David Woolweaver, K5RAV was at Green Country Hamfest. Oklahoma Section Emergency Manager N0IRW was at the ARRL booth. N0IRW, left, presents the Assistant Emergency Coordinator, KC5UEG, with his certificate. Oklahoma Section Manager Kevin O'dell, left, awards Mark Conklin, N7XYO with his new appointment as the Section Emergency Coordinator at the Green Country Hamfest. Here's a fine example of the floor space at the Green Country Hamfest. Thanks to Nathan Huffstetler, AE5NK, Tulsa County ARES PIO, for these photos. April 2nd – Hanging Judge Hamfest, Ft. Smith, Ark. April 2nd – Ham Expo, Belton, Tex. Hi Everyone in the Oklahoma Section!! WOW! Roland Stolfa KC5UNL and I had a great time out at the Elk City hamfest. As, always, there were lots of great folks and wonderful fellowship. The League forum was very well attended with a good exchange of information….we even gave away a number of goodies, if you weren’t there, you missed out. I would like to say thank you to those guys and gals that work so hard to put that fest on….and from what I heard the noon lunch was GREAT! The forum had a great turnout with a lot of stuff to discuss. First we announced that Charles Goodson, KC5UEG has stepped down from the SEC position to ASEC. I have appointed Mark Conklin, N7XYO the new SEC. Mark has a lot of experience in EMCOMM and will do a great job. We discussed HR 607 and how we need to respond. You can go the League website and find out the current status and how to write your congressman to protest the bill in it’s current form. We also discussed some ARES information. There will be 2 levels of ARES membership in Oklahoma. Associate Member and Full Member. The Associate Member only needs to have a license and a willingness to help. They need to sign up on the League website and the ARES Oklahoma site as volunteers. We are going to start issuing ARES credentials. Only Full Members of ARES will be eligible to receive these credentials. In order to qualify as a Full member, you must send us confirmation of your having completed ICS 100, 200, 700 & 800, have a DPS Amateur Radio Identification number and approval of your EC or DEC. We are still working out the details on how this will work operationally and will let you know very soon how it will all work. These credentials will be readable by OHP and recognized by pretty much all of the state agencies. As far as upcoming hamfests……….Durant is always fun with some GREAT Jambalaya made by Joe White’s lovely wife. Ham-Com will be the ARRL National Convention. There will be a large contingent from HQ there, so come meet some of the folks that work for you everyday. The guest speaker at Ham-Com will be Riley Hollingsworth. Texhoma Hamarama will be the West Gulf Division Convention with Mike Corey, Emergency Communications and Preparedness Director from HQ scheduled to be here. 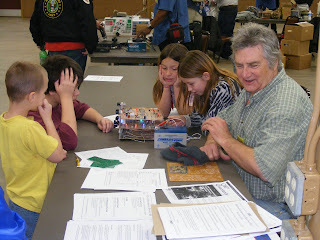 Then Enid is the traditional end of the hamfest season the first weekend in November. The Viking Radio Club in Lawton is staying busy with a lot of events including Radio in the Park. If you get a chance, check them out. Anyone interested in becoming a Public Information Officer for their club or ARES, contact Lloyd Colston, KC5FM, kc5fm@aol.com to join the PIO ranks, you do have to be a current ARRL member and you have to complete the PR 101 course which is now on-line for free. Even if you aren’t interested in becoming a PIO, the course has a lot of great stuff to help you get the word out on your local amateur radio doin’s. If you are into Twitter and Facebook, Lloyd also has Twitter and Facebook sites for the Oklahoma Section…….check them out as well. For those of you wondering what happened to 2010, regrettably, due to unforeseen circumstances, namely serious health issues with the person who handled the logs, there are no scores to post for 2010, due to unavailability of logs. Please do not let this discourage you from participating this year. Connie, K5CM, and Pam, N5KW have taken on the responsibilites of OKQP Manager. As a safeguard this year, Gene, W5LE, will be also be provided a copy of all logs submitted. Please review the 2011 rules carefully. 19 March - 0800 to 2100 CDT (1300 to 0200 UTC)* 20 March - 0800 to 1400 CDT (1300 to 1900 UTC) *May only operate a total of 12 of the 13 hours. Off times must be a minimum of 30 minutes. Stations outside of Oklahoma work as many Oklahoma stations in as many Oklahoma counties as possible. Stations in Oklahoma work anyone. Stations outside of Oklahoma send signal report and State, Canadian Province, or DX. Oklahoma stations send signal report and county. Oklahoma stations working other Oklahoma stations will be logging the other station's county, and that station's county counts as a multiplier. Entries with incomplete or improperly logged QSOs will be subject to penalties or disqualification. Each complete non-duplicate Phone contact is worth 2 points. Each complete non-duplicate Digital/CW contact is worth 3 points. No partial contact credit. All non-Oklahoma stations use Oklahoma counties for a maximum of 77. Oklahoma stations count U.S. states (50), Canadian Provinces/Territories (9), and Oklahoma Counties (77) for a possible total of 136 multipliers. The total score is the total number of QSO points multiplied by the total number of multipliers. 160, 80, 40, 20, 15, 10, 6 meters WARC band contacts do not count. *Rovers are allowed to sit on multiple county lines but they must make separate QSO's and separate log entries for each county. In other words, W5LE 599 GAR/GNT/KAY/NOB is NOT allowed as a contest exchange even if you put four separate contacts in your log. You MUST make four separate contacts. Rovers that sit on county lines must have the means to determine that they are really on the line. Close is not good enough. If the county line is in the middle of an intersection, and it is not safe to sit in the middle of the intersection, then please operate the counties separately. example qso between K5CM and W5LE W5LE is in OKM K5CM is on DEL/ADA county line cq cq de k5cm/m w5le w5le 599 del r 599 okm r es 599 ada r 599 okm tu k5cm qrz oqp Obviously "es" could be replaced with "and", or "now", or "also"
Keep the info coming……the more stuff I get, the more fun this is!! Spectrum Attack – How you can help! there is a lot of great material on the horizon for Public Relations! ARRL, should contact their Section Manager. will be given to ARRL and WGD volunteers for their participation! -----Spectrum Attack – How you can help! available when the FCC ended analog television broadcasts in June 2009.
bands of 420-440 MHz and 450-470 MHz. for auction the 440 MHz band to make it happen. We must let our U.S. Representatives know we oppose the current wording of HR 607.
displayed ready to be printed and signed. Co. is the ARRL's legislative relations firm in Washington, D.C.
sent to Representatives the better. This is your opportunity to make a stand against this legislation. W5TYD, if you would like to volunteer your expertise. Henry's E-Mail address is w5tyd@arrl.net. Hamarama is one of the longest running Hamfests in the Division. are awarded each year. Make your plans now to attend! Relief legislation in Oklahoma until experience was gained in Texas. WJ1B, ARRL COO presented an informative power point tour of ARRL HQ. and John, K5IZO and the entire Brazos Valley ARC for a great event. stopped by the ARRL booth to say hello and to renew their memberships. put this event on your 2012 calendar! K5RAV – Executive Committee meeting March 19th. obtain insight to Division and Section matters. With my recent appointment to Section Emergency Coordinator that brought on another changes with in ARES-OK.
Ben Joplin WB5VST will be stepping up to the ZEC position for Zone 4&5. Ben is a long time amateur operator and very good hand in the field. Ben has worked many hours in both trainning and on deployments during communications emergencies. He was on site at Camp Gruber, Oklahoma when evacuees came up for the gulf area during hurricane Kartina. He is proficent in may diffrent operating modes and is not affraid to jump in there and try something new. 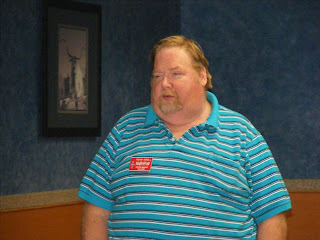 Ben has been a long time member of the Tulsa Repeater Org. and has serves as a club officer several times. With in the last few years Ben retires from the IT and communications dept of AEP/PSO. Plus - Jay Eimer AD5PE is steping up and has accepted appointment to the EC for Rogers County in Zone 5, District 1. Jay is another long time amateur with lots of experience with emergencey communications to bring to the table. Thank you for both Ben and Jay... with our good amateurs volunteering to help lead, and build ARES Oklahoma we can not make it happen. We have a change in the section cabinet. Charles Goodson, KC5UEG has decided to take a step back from the duties as the Section Emergency Coordinator. Charles will become an Assistant SEC working with some folks in the North Texas Section on some FEMA contacts. I am pleased to announce that Mark Conklin, N7XYO will be replacing Charles as the SEC. Mark has a lot of experience as a Zone EC for the Tulsa and Northeastern portion of the state. I look forward to working with Mark in his new position. I would also like to say a big thank you to Charles for 3 years of service to the section as the SEC. So, again, as of now Mark Conklin, N7XYO is the new Oklahoma SEC. Congratulations Mark and thank you as well. 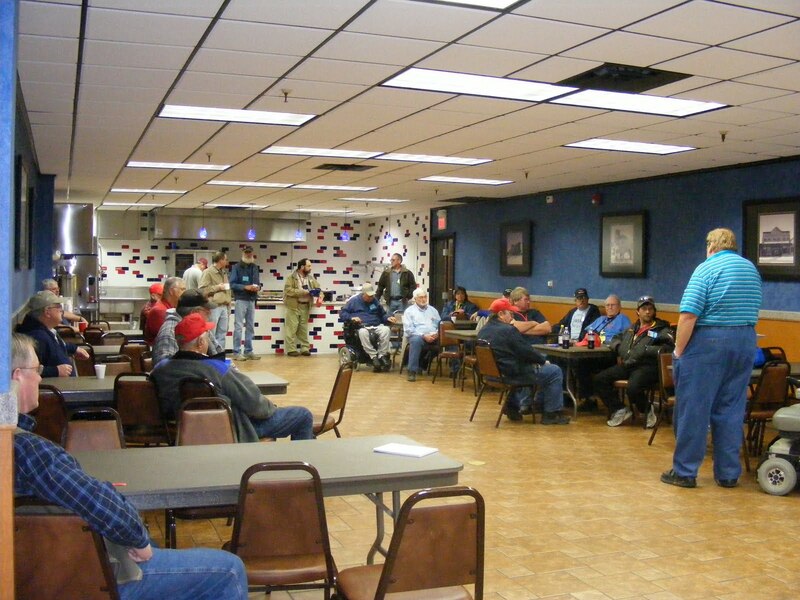 Oklahoma Section Manager Kevin O'Dell, N0IRW lead the League Forum at the Elk City Hamfest. Attendees at the League Forum in Elk City. Remember that the Oklahoma Section Convention is March 11 and 12 in Claremore. Come see your League membership and leadership there. to L-R Jacob, Andrew, Brandy and Jade Johnston. 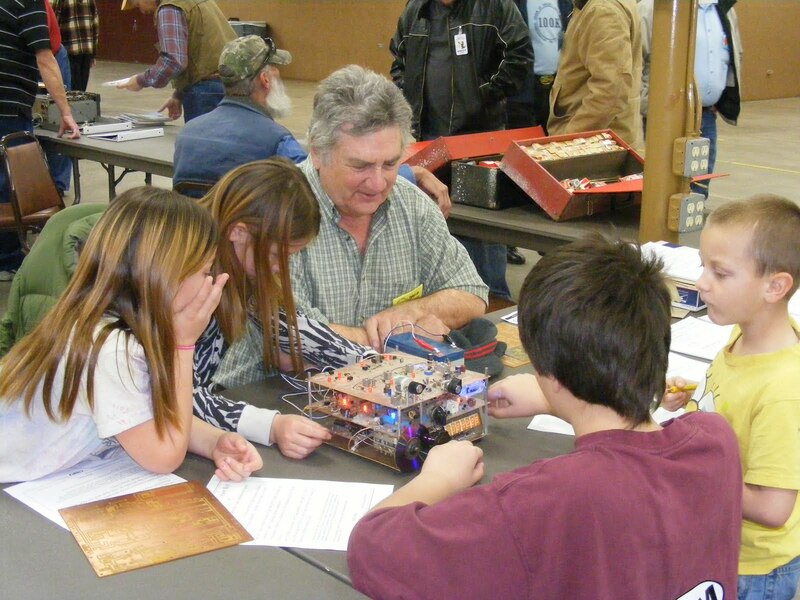 David White WN5Y of Pampa, TX showing how the Electroluminecent Receiver Kit works. Mike Corey, W5MPC, the Emergency Preparedness Manager for the American Radio Relay League, spoke at the National Severe Weather Workshop in Norman. This annual event brings amateur radio enthusiasts, emergency managers, weather professionals and amateurs to learn new skills, tips, and information related to severe weather. During his talk, he described the League, the Amateur Radio Emergency Service and the League's Field Organization. "The ARRL supports the Skywarn program", said Corey and cited the Memorandum of Understanding between the League and the National Weather Service. Storm Spotting and Amateur Radio is a new book from the League. "We look out for ALL amateur radio operators, whether they are a member or not," he said. The Field Operations helps gather reports and helps with after action reports. "Look at the ARRL as a resource," said Corey, who mentioned the number of ways the League can help, including QST. Corey encourages all amateur radio operators to register for ARES, get trained and stay trained, get connected with your Section leadership, and get involved. Corey fielded a Twitter question about changes in the ARES program. "Major changes don't come easy," he replied. Smaller changes will happen from time to time. "We are aware of the interest in modernizing ARES," he said. Corey fielded a question about reallocation and mentioned the need to comment on HR-607. - Do not send this letter or any letter about HR 607 to your U.S.
delivery makes a particular impact on members of Congress.